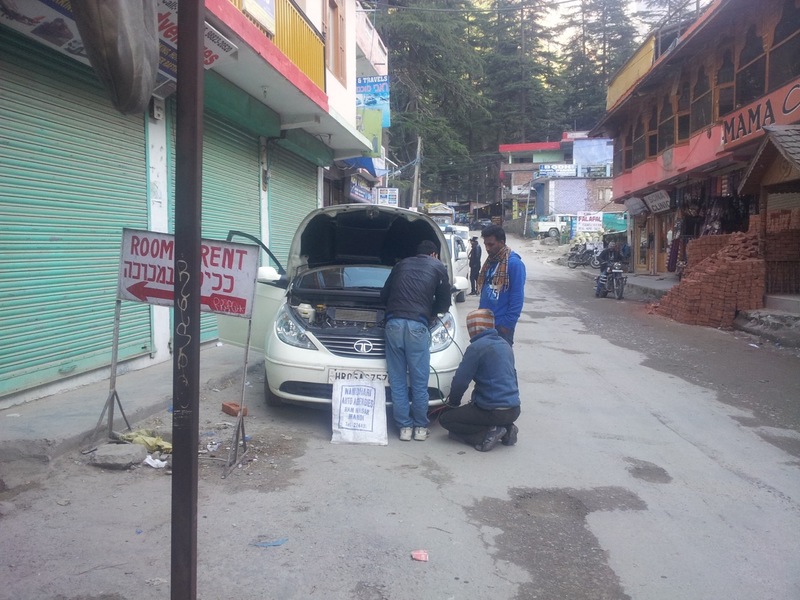 Kasol has really less useable hours as compared to other places I have been to. Sunlight hits the valley at 9:00 am and goes behind the mountains by 2:30 pm. Any activity must be done within this available time. 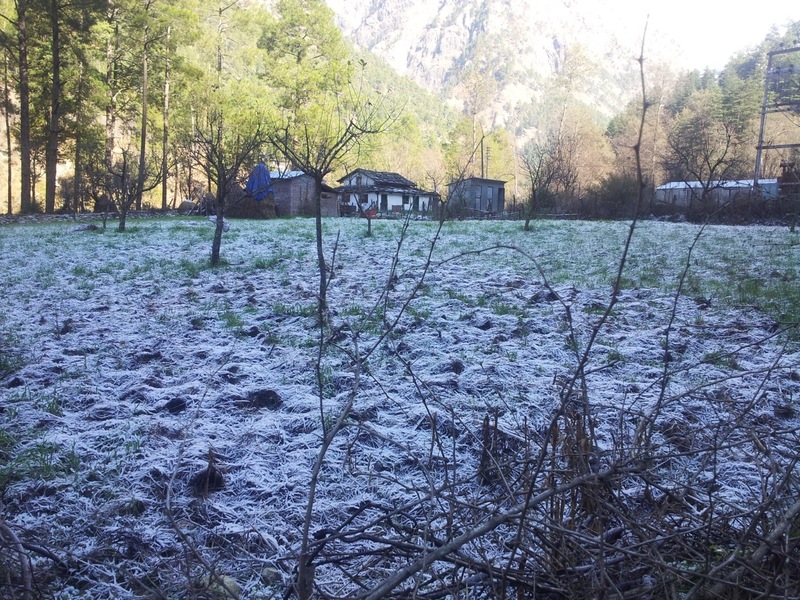 At night, temperatures fall to -3 or -4 degree Celsius. I had a hard time writing on the cold metal body of my laptop yesterday night. Hence, I am drafting this post at 3:00 pm, when temperatures are still manageable. Right now, even my laptop is covered with thermals to ensure that I am near the lower limit of operating range of a Macbook Pro (operating temp: 10 to 35 deg. Celsius). 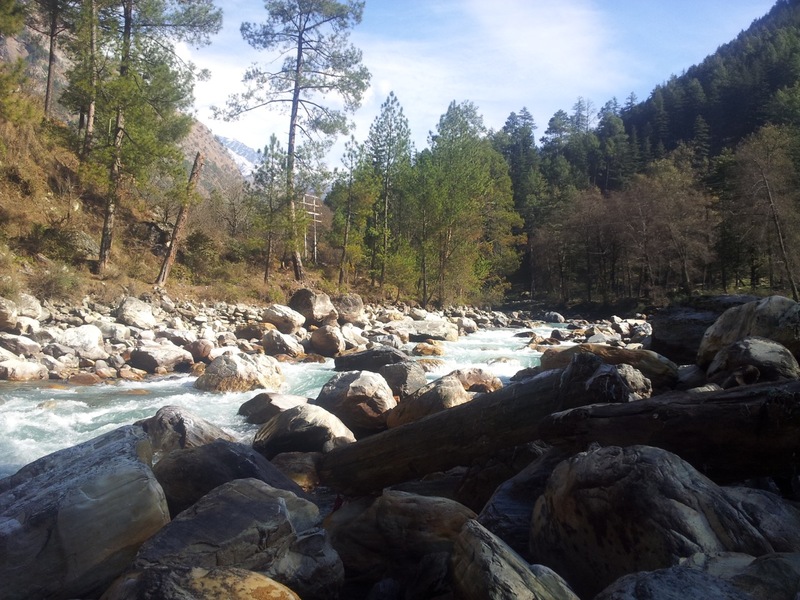 I was informed that Baba Place can be reached by walking beside the Parvati River. I did not know what it was. I just hit the trails. 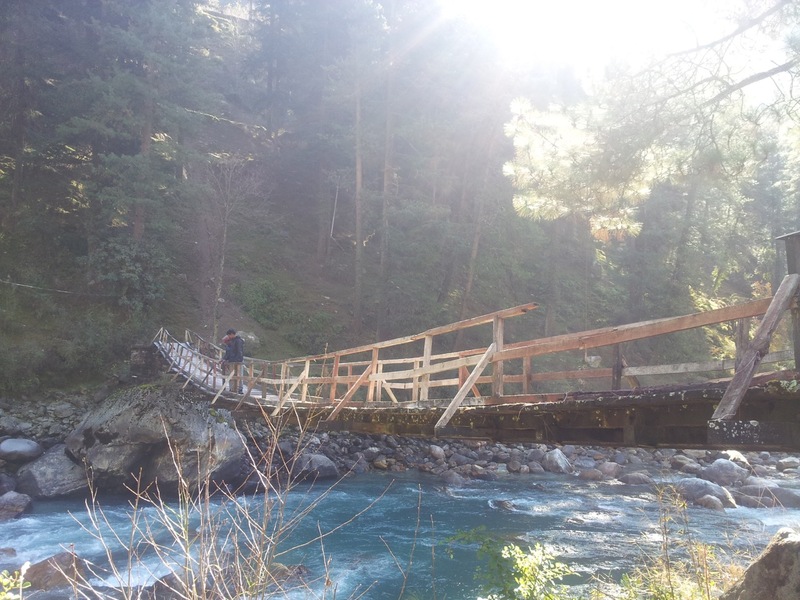 The trail starts from a bridge that crosses Parvati river from Kasol. One must ask the locals the route to Chhalal village as the bridge is not easily visible from the main road. There are graffiti on this bridge. There are graffiti all around. 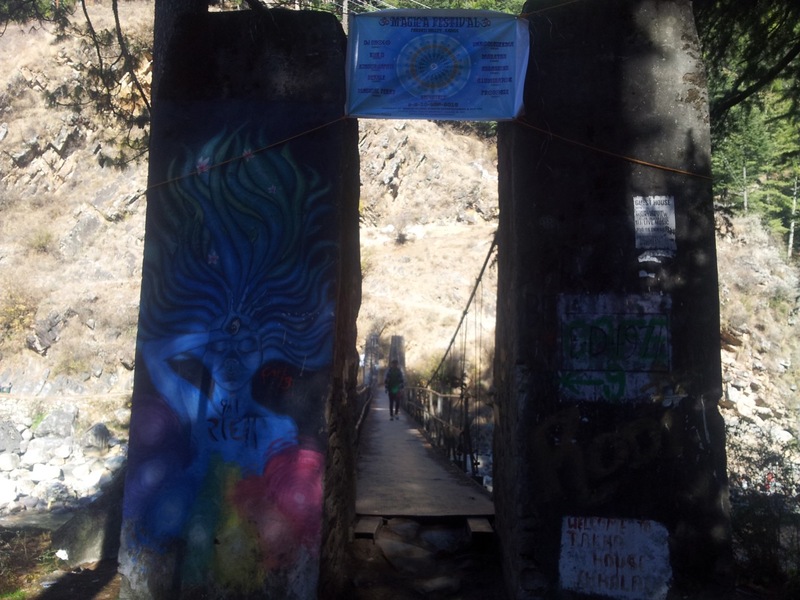 This is a good indication of the hippie and junkie culture prevalent in Kasol. Parvati River from the bridge. En route. there are a lot of cafes and log houses that cater to the intended tourists. Reaching Chhalal village wasn’t that difficult because of these cafes and the signs / graffiti they had painted on the rocks. 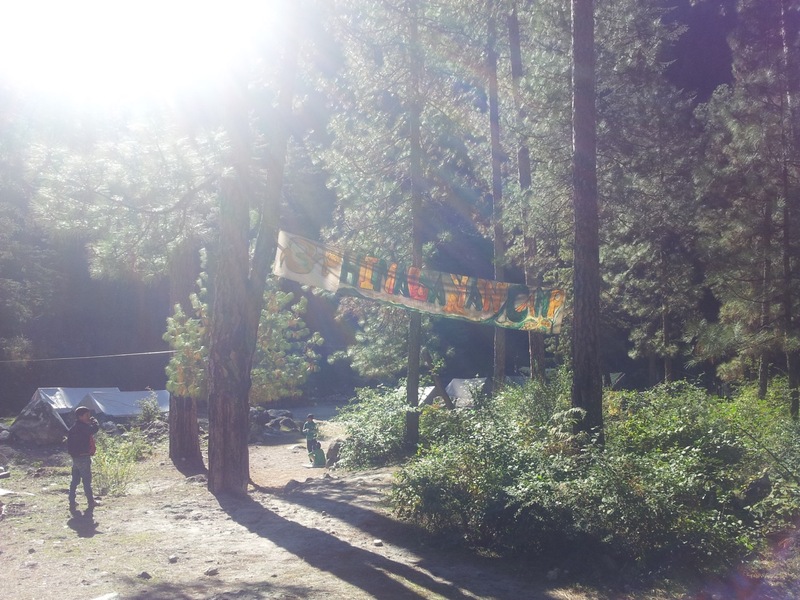 Even tent houses are available for rent in Kasol. It might be a good idea to stay here in the summers. I wouldn’t suggest staying here unless one has good thermal protection. 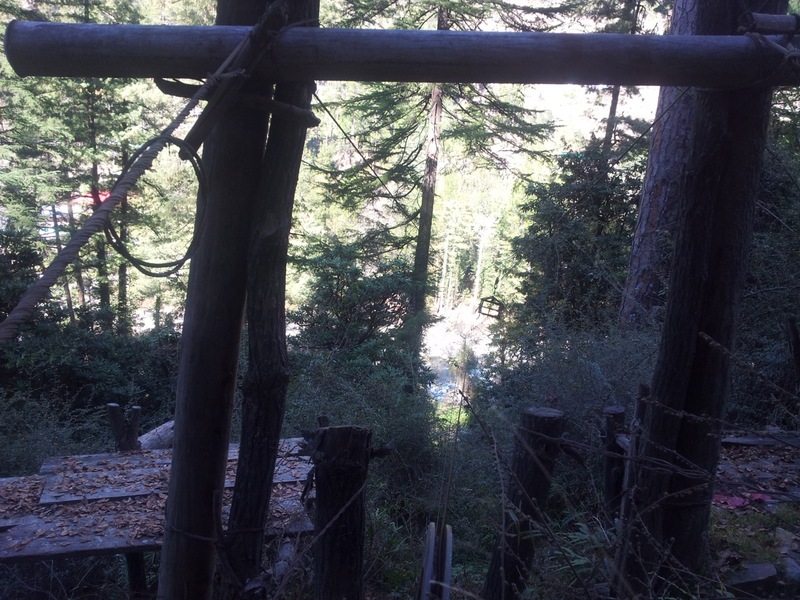 The trail passes right between the houses of Chhalal village. This is a cowshed located beside the trail. Chhalal village is a small village. There is a government primary school that caters to the neighbouring villages. I asked the locals how to get to Khatagla village and they showed me the way. 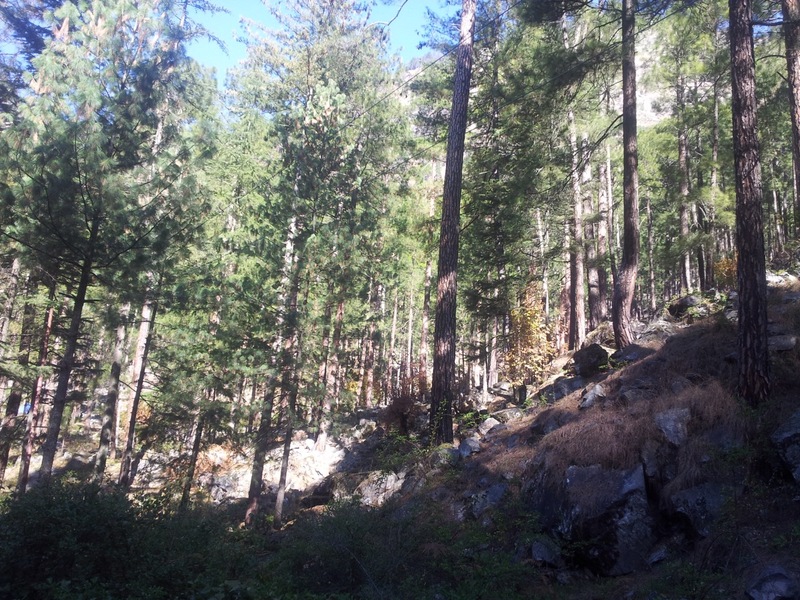 The trail deviated from the river bank and I was soon walking through uninhabited land covered with pine trees. 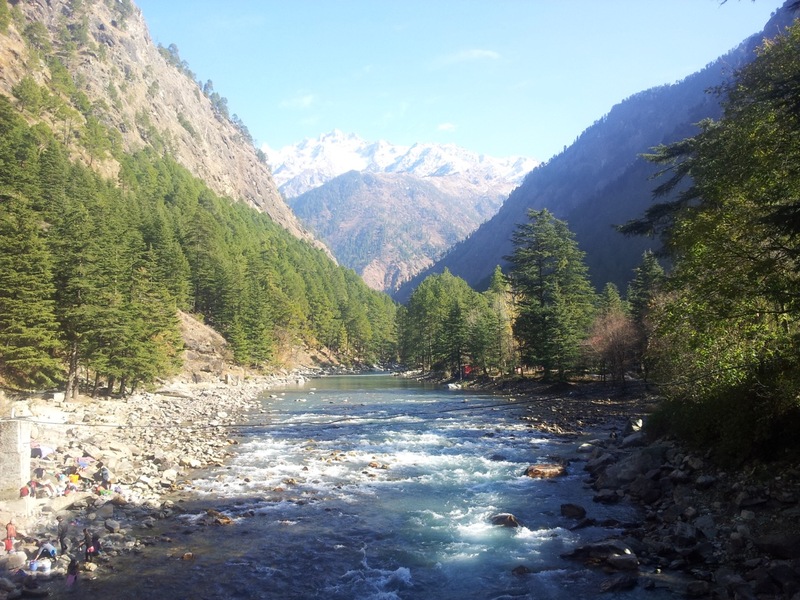 Tall pine trees cover the Parvati Valley. Beyond a certain altitude, the vegetation vanishes. 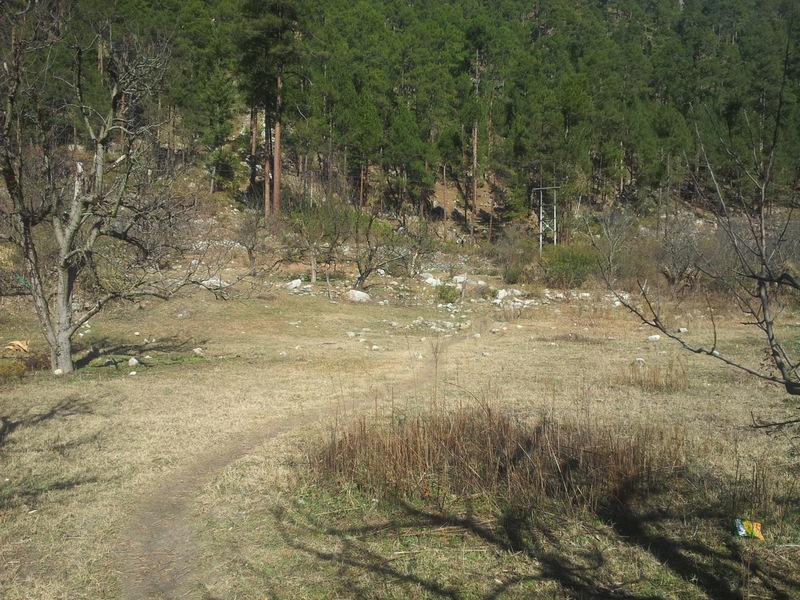 The trail doesn’t pass through Khatagla but circumvents it. There is a stretch of the trail where the trail is bordered by thorny shrubs. One has to be very careful. Thankfully, the clothes I was wearing were piercing resistant. At one point, I encountered a wall. There was a road that stopped at the wall and continued on the other side. Initially, I thought that I was encroaching someone’s private property. The wall that cuts the trail is visible behind the leafless trees. 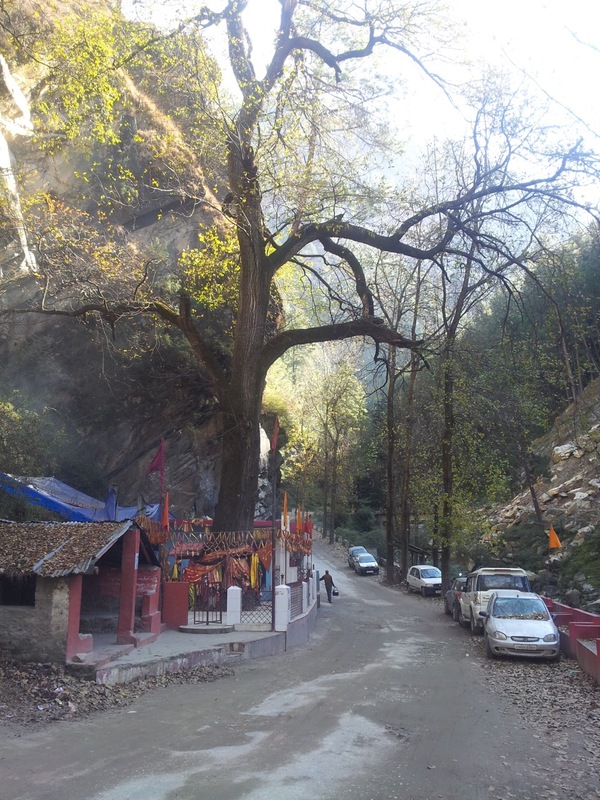 Baba Place is situated on the Manikaran road itself. In order to reach there I had to cross the river again and follow the trail on the other side. I crossed this wooden bridge and asked the two men for directions. 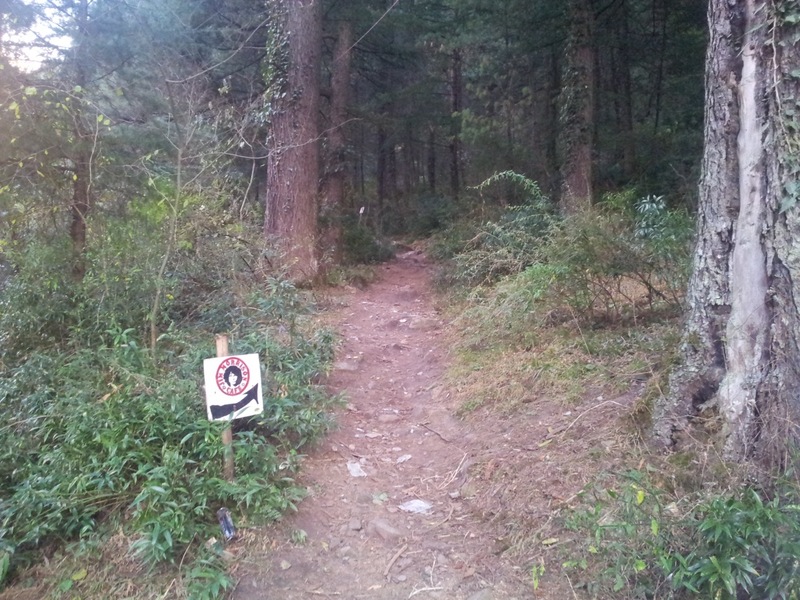 I had actually overshot the trail which I had to take to ascend to Baba Place. I just wanted to walk along the river. I sat at this spot for a long time and munched on some dark chocolate. The clouds made an interesting pattern in the sky. As if, the mountain was a chimney. While ascending I came across areas where the Sun doesn’t shine at all. This is frost. Condensed water freezes in sub-zero temperatures at night. The absence of Sun rays prevent them from melting. I finally reached Baba Place. 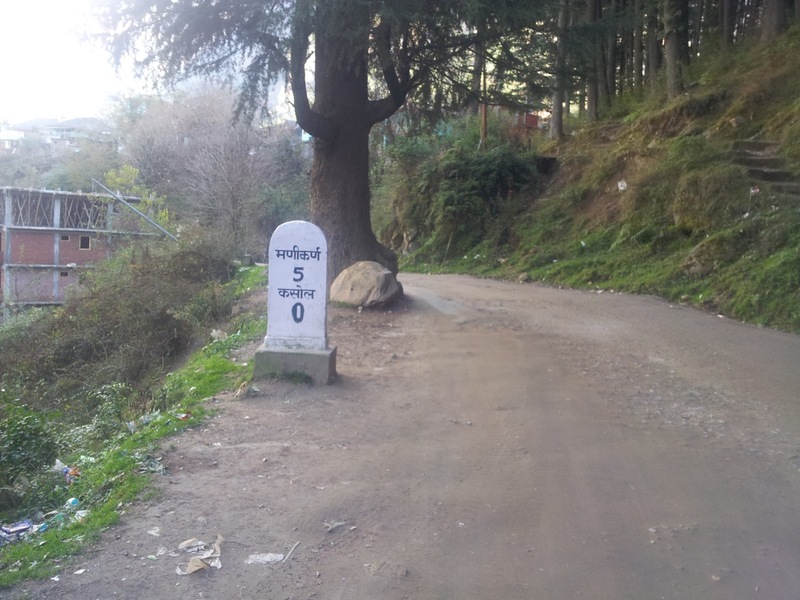 It is situated about four kms from Kasol bridge, just after the signboard that declares the border of Kasol Forest Region. There are many small temples beside the brook that connects to Parvati River. There is one large Shani temple and one Shiva temple. I asked a local devotee why such a name. It turns out that there are shelters adjacent to the Shiva temple where Sadhus and other ascetics make their pit stop. This temple and the shelters adjacent to it is collectively known as Baba Place. On my way back, I took the shorter, main road. 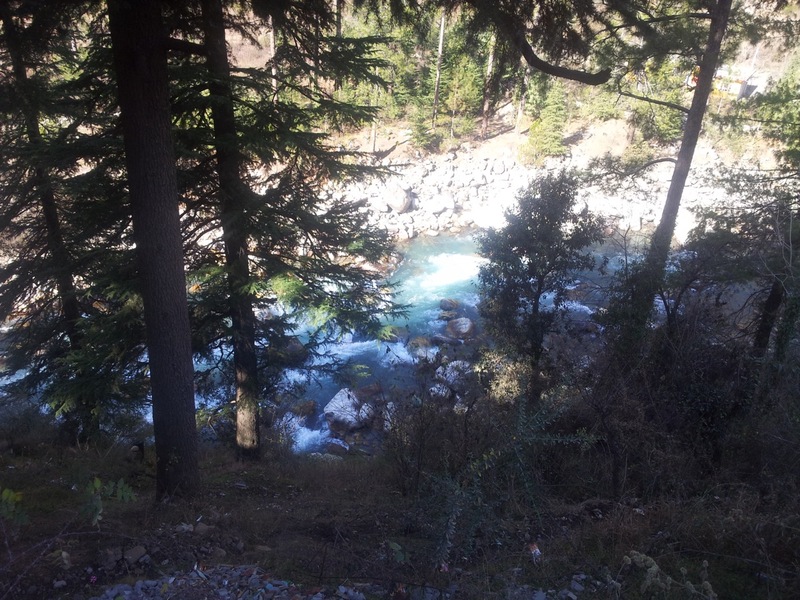 Parvati River from the main road. These ropeways are used to transport heavy items to villages in remote terrains. I have seen them in Meghalaya, too. The trail was short but very enjoyable. Devoid of any technicalities, it is something that even families with small kids can undertake. 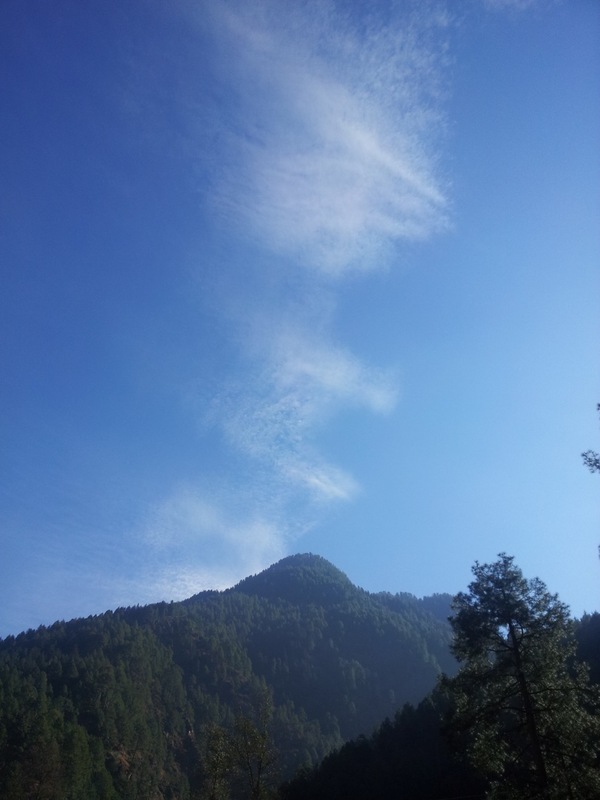 I was back at Kasol. I might go to Manikaran tomorrow. 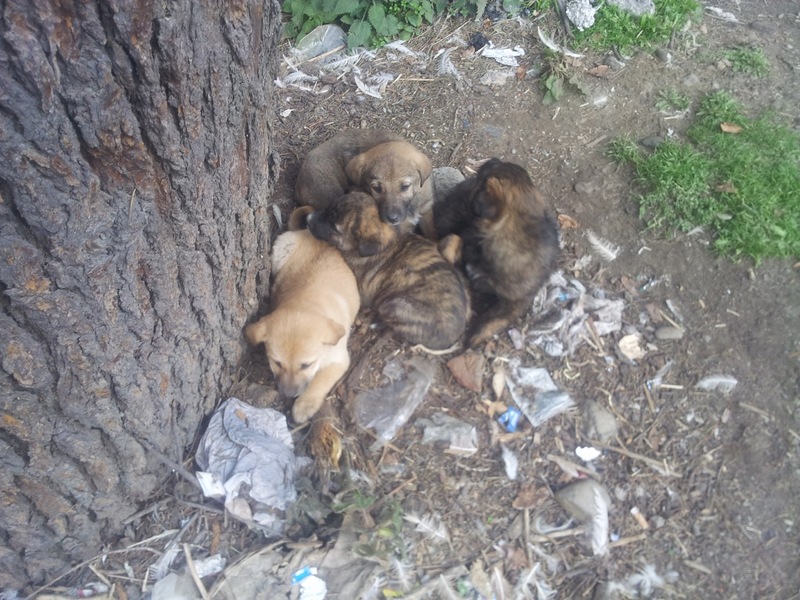 I also found the litter from where Anubhav might be picking up his cuddling companions. There are actually five puppies. One is hidden underneath the others. Just in front of my building, a car was standing with its bonnet open and required battery assistance after it was exposed to an entire night of sub-zero temperatures. On day 14, I had written that some of the worst cars to drive on hills are the Tata Diesel variants. Not surprisingly, this one was a Tata, too. Stating a car with battery assistance. It took me well over two hours to draft till this paragraph of the this post. I could barely keep my fingers exposed. I could write for only ten minutes straight. Then I had to put my hands in my jacket pocket for another ten minutes to warm them up. 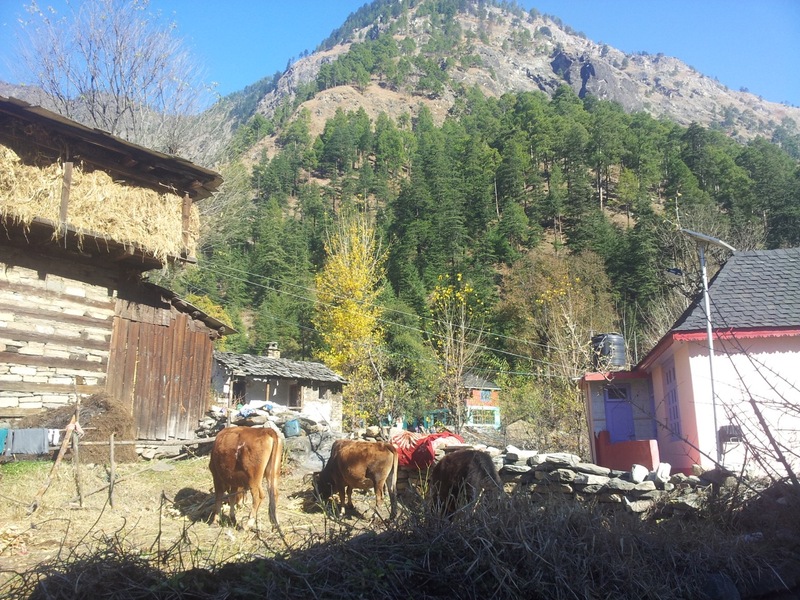 I stopped writing and went walking on Manikaran Road. I had walked about a kilometre when I opened Google Maps. I saw an isolated cafe called Jim Morrison’s Cafe. The cafe can be reached only if you are ready for a nano trek of about 200 m uphill through the woods. One has to walk the trail to reach the cafe. These small signs (only 3 en route) were my only guide. I was happy to see the heating system being prepared. I badly needed that. These heating systems use burning wood splinters to heat up the room. Two workers preparing the heating system for the night. They serve only vegetarian food there. I had coffee and a banana pancake. The pancake was quite good. I also watched a foreign hippie (all Marley-ed up) preparing his hash meticulously and religiously for a good 30 minutes before lighting it up. He carried his entire equipment with him in his bag. 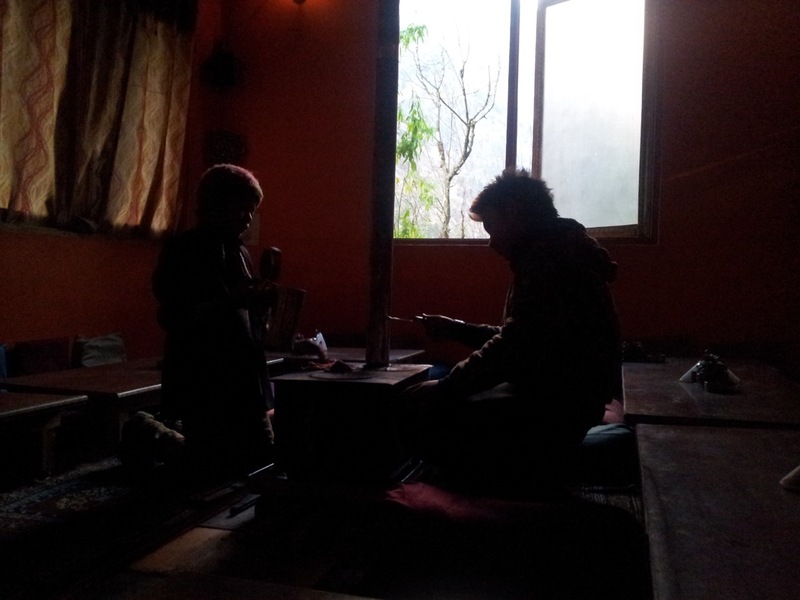 Such occurrences are pretty common in almost all Kasol cafes and nobody bothers these hippies and junkies. The ambience had probably amplified his high with dim lights and Psychedelic Trance music (which was probably the farthest thing from what Jim Morrison had created).